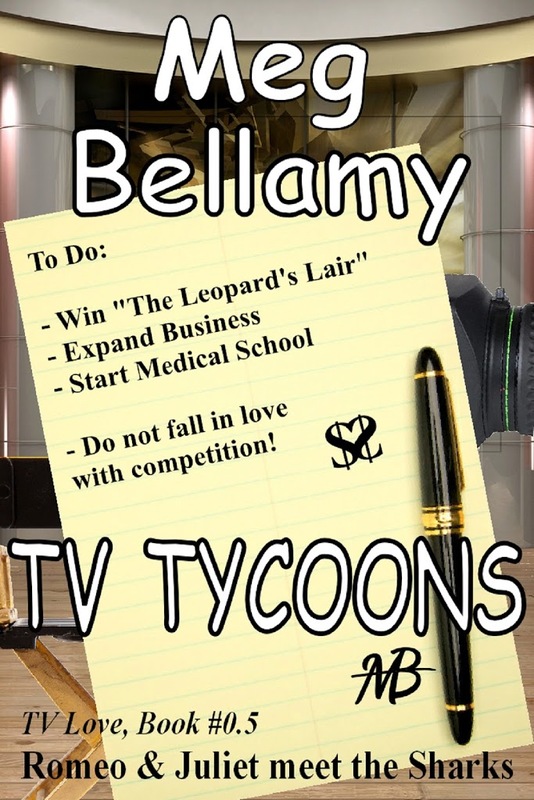 Today on First Sight Saturday I welcome Meg Bellamy with her contemporary romantic comedy novella set in reality TV, TV Tycoons, which is a prequel to TV Bride. The Leopard’s Lair is a reality TV show where new entrepreneurs present ideas and compete for successful, rich people to invest in their businesses. 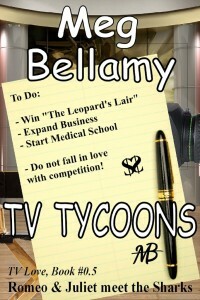 Jillann Ryan has to win the top prize on The Leopard’s Lair. Without that money, she can kiss her chance to go to medical school good-bye. Or worse, her brother Derek will go bankrupt. Zach Vincenzo eats, sleeps and dreams business. He needs to win The Leopard’s Lair to keep his growing company out of the red. Zach Vincenzo couldn’t wait to get on the sound stage to present his pitch. The Leopards had to go for it, had to see his was the most brilliant idea to come down the pike in ages. Overextended because he’d expanded too quickly, he needed an infusion of cash to tide him over until he got his balance back. Six months should do it. Just this once, he was willing to put up with having an investor involved — for a short time. Zach would break speed records to pay back the investment with interest and regain his total independence. The moment the emcee completed his introduction, Zach strode out and looked the Leopards straight in the eye. “My business, Beauty and Health, which brings salon services to patients, has proven to be a natural money maker in hospitals.” He expected people to be impressed by his brilliant concept, so he was almost thrown when they gazed back, less than overwhelmed. Luckily, he had an innate ability to regroup and change direction. He’d wow them. “What do you mean?” Carl growled. Nothing about this presentation was going the way Zach expected. He didn’t like to be thrown a curve ball when he’d prepared for a straightforward pitch. What? He had competition here on the show? What the heck? Zach’s surprise grew when his competitor turned out to be a drop-dead gorgeous blonde whose smile outshone the studio wattage. Under any other circumstances, he’d ask her out on a date. Ted lumbered across the sound stage, clamped a hand on Zach’s shoulder and on the woman’s and introduced him to Ms. Couldn’t Possibly Be Competition, Jillann something. “Are the cameras still rolling?” Zach snapped. “Yes. We figure what’s happening now is an original twist, and that will make our show unique.” Ted bared his teeth in what might have been a smile. “Ryan. Jillann Ryan.” She spoke softly but had a strong grip. Zach looked into intelligent, clear blue eyes that flashed a hint of steel. Beautiful and bright. Definitely nobody’s pushover. He stood even straighter and marshaled his forces. Challenges wreaked havoc on schedules. How big a threat to his future stood before him right now? At first, Jillann thought being called back on stage signaled good news. Her heartbeat had sped up. Seeing the tall, dark-haired hunk with the smoldering gray eyes hadn’t clued her to start worrying, despite his frown. “Zach Vincenzo.” He peered at her. Should his name mean something? Nothing sprang to mind. Why was he narrowing his eyes while all the Leopards stared and Carl smirked? “What’s going on?” No sense playing guessing games. Jillann’s stomach flip-flopped as her inner pessimist took over. She braced herself. If she failed here today, she’d have to postpone med school. Again. No way would she let Derek go under. Since their brother Nick wouldn’t be able to save the day on his own — Jillann needed to focus. Sounds like Zach is going to get an attitude adjustment under the glare of reality TV lights! Thank you for sharing an excerpt on First Sight Saturday, Meg.